Congratulations to the Men of Mohawk, who clearly relish their well-earned accolades. 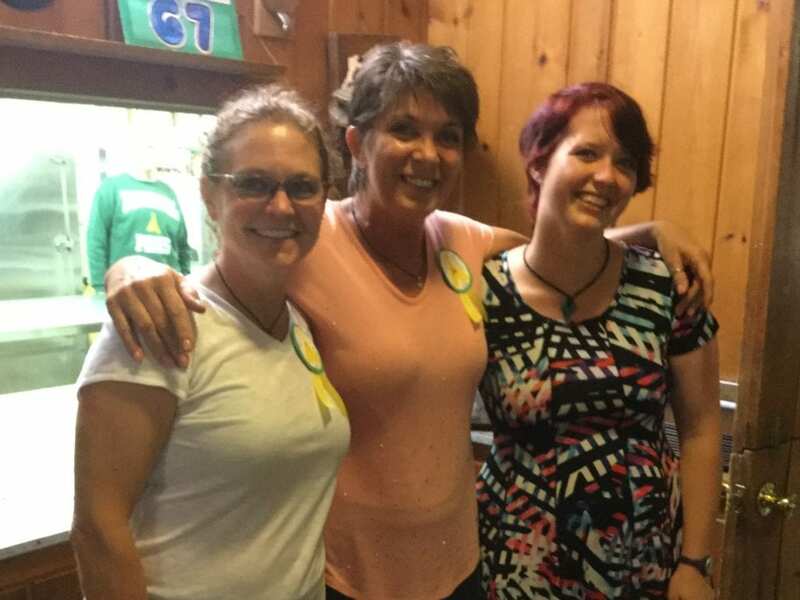 Weekly Camp Special Event – TP Fair! The fierce – often unruly and always entertaining – TP Clown contest was won by Daniel Mc H in Cabin 12, with a Special Mention going to the C4 Clowns, Emetic D and Lucas H-S.
Towering Pines turned 73 years old this week! Cake of the Summer: A chocolate canoe cake with Long John oars. It was as delicious as it was cool! 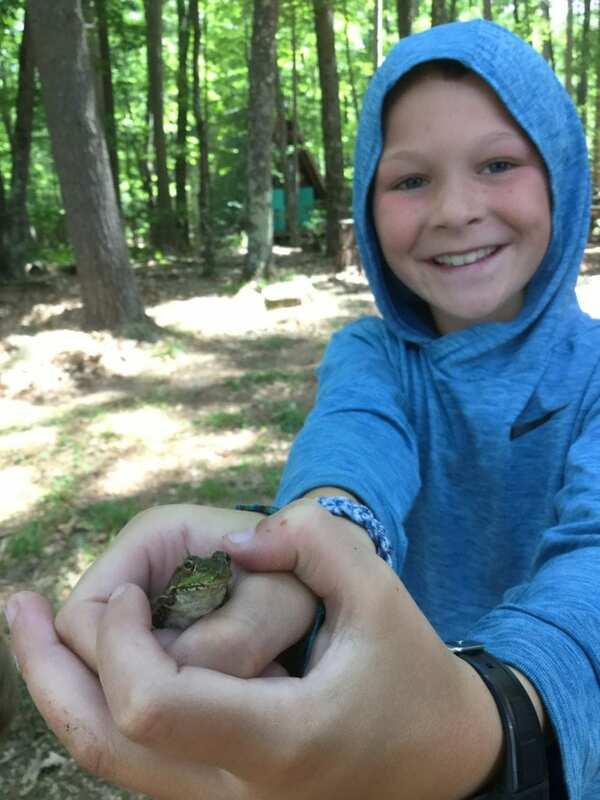 Once or twice per summer, TP has an Adventure Day and when campers choose among several activities outside our normal routine. 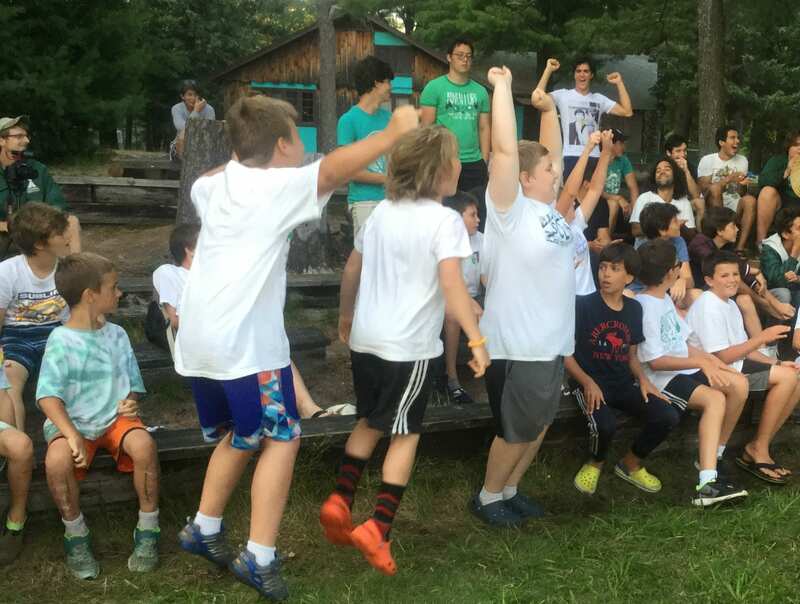 Led by TP staff, it’s a great way to stir up some fresh energy as we move into the final weeks of camp. 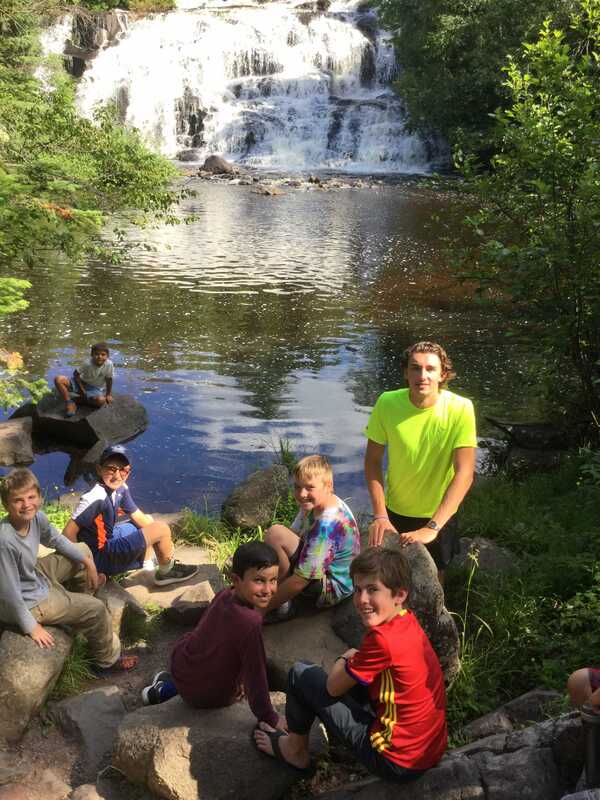 Jeronimo P relaxing with the campers who opted for a trip to the beautiful Bond Falls. A canoe trip on the Wisconsin River. A bike ride on the St. Germain biking trails. A Lake Nokomis fishing expedition. A trip to the Wildwood Wildlife Park in Minocqua. A hike to Lost Lake for s’mores, then a visit to the Moss Garden. It was tie-dye week at TP! 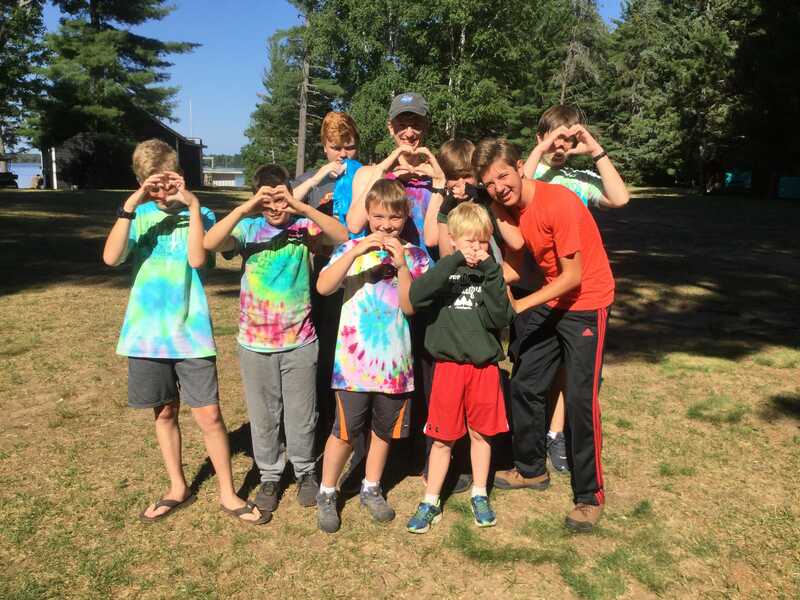 TP Craftsmen showing YOU some tie-dye love! Most of the campers dyed their “Adventure Awaits in 1-8” camp tees. The colors really pop! Nice job kids. Kudos to Crafts Director Andy E for organizing the project. The tees have been rinsed, but it’s a good idea to wash the tie-dyed tees by itself, in cold water, for that first cleaning. The Zoo had a great week, catching several species of frogs for the terrariums. 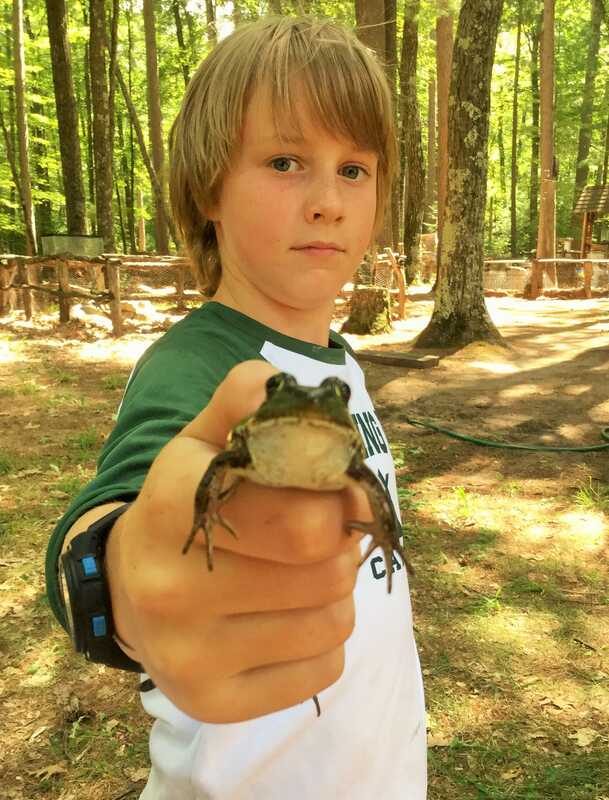 To keep them safe and healthy, the wild TP zoo animals (frogs, snakes, newts, fish, etc.) are released back into the wild every week or two. Animals are released in the same location they were caught. “Where did you learn to smooch?!! Here, let me try..”. Riflery ranks are measured on a combination of points 5 shots per round, 50 max points per round) and shooting positions; prone, sitting, kneeling, and standing. The ranks below are listed from easiest to most difficult. Archery ranks are earned through a combination of shooting distance (from the target) and accumulated points. The archery target has 10 concentric rings. The innermost (smallest) ring, a.k.a., the “bullseye” is worth 10 points. The next outer ring is worth 9 points, the next 8 points, and so on. The outermost (biggest) ring is worth 1 point. Missing the target completely is 0 points. Archers shoot 5 round of 6 arrows, i.e., 30 total arrows to accumulate enough points to earn a rank. The ranks below are listed from easiest (White Yeoman) to most difficult (Gold Archer). You may notice that 10 yards are added each time you jump to a new color, but that the required points at each level stays the same (80 points for Yeoman, 120 points for Bowman, 160 points for Archer). Bernardo H shot a 47 at 20 yards. Eli W shot a 35 at 30 yards. 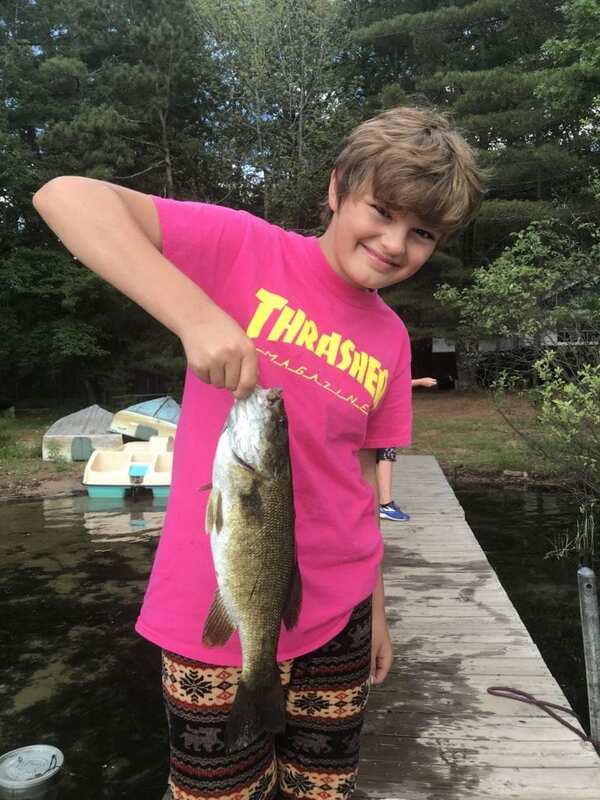 Daniel McH caught a …2” minnow. Hey, don’t laugh. Those little ones are tough to catch – it’s like capturing the Snitch in Quidditch! Domenic G caught a 20” large mouth bass. 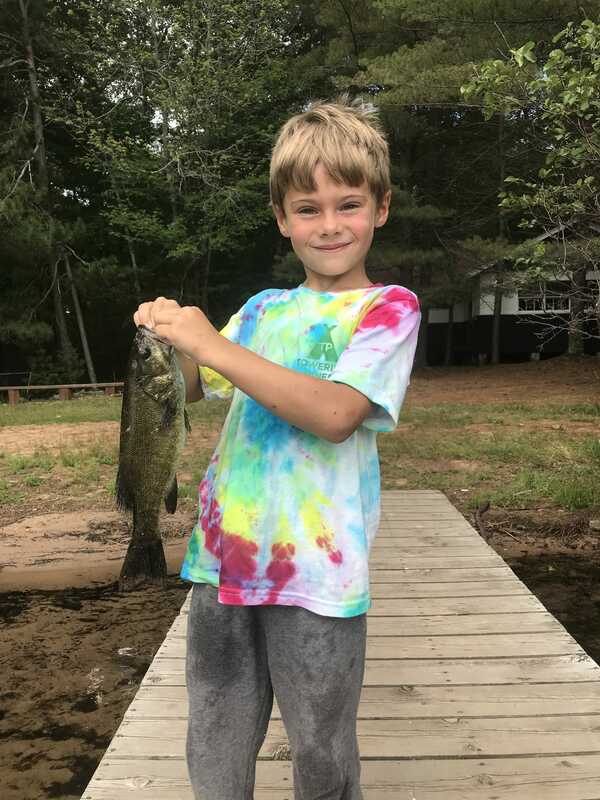 James W caught an 8” rock bass. Henry St caught a 10” perch. Emeric D caught a 9” large mouth bass. …and this is the camper we used for the bait. He’s fine, it’s all good. Sail Race – oh no, the regatta has been hijacked in favor of a…Dread Pirate Regatta?!! Ethan J, henceforth known as… Captain One-Shoe. Congrat-yar-lations ye hideous sea bandits! 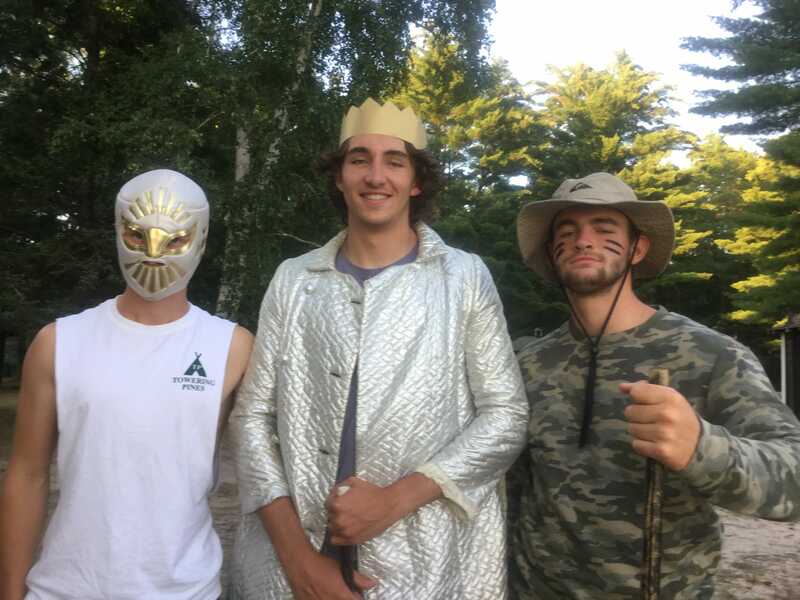 Skipper Finn Van H, supported by crew Ethan J and Thomas K, defeated our Woodland sisters in the camp competition. *Level 7 is offered at TP, for campers who wish to further improve their swimming knowledge and technique. 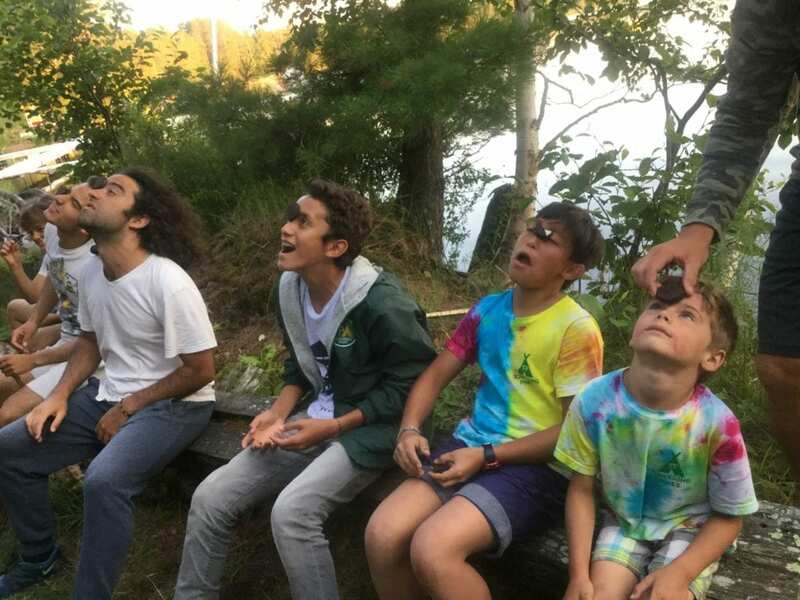 The Oreo Challenge is a camp classic, and always delivers lots of smiles. Put an Oreo cookie on your forehead. Use ONLY your head and face (no hands! ), to get the Oreo into your mouth. 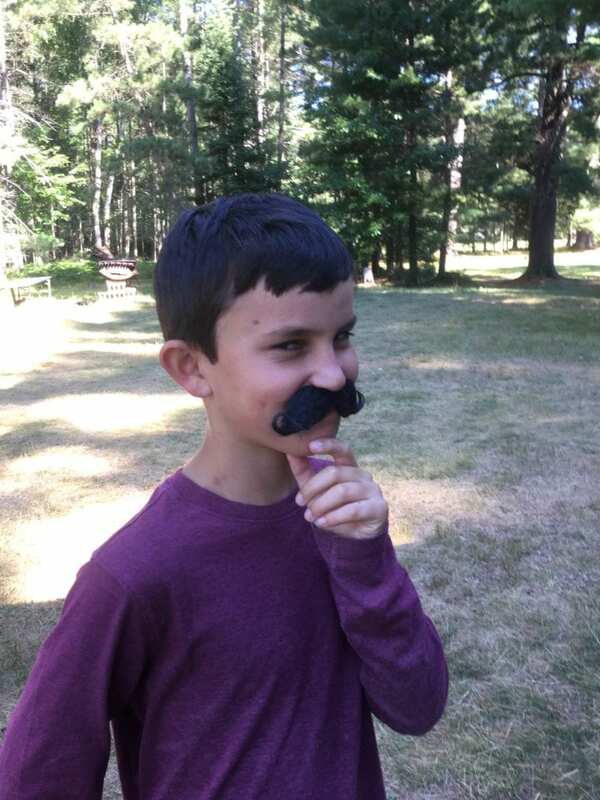 A mustachioed Eli W practicing his “Ha! I’m about to deliver a gobsmacker of a dad joke” look. You can never start practicing too soon – well done Eli! Have a great week my friends! !